Do you know how the MTA cuts affect your daily commute? During this widespread recession, New Yorkers everywhere have tried to save on their daily commutes by relying heavily on public transportation. For us residents of Lower Manhattan, specifically Battery Park City, our commute just got crappier. On June 27, the transit changes go into effect which include the loss of key subway and bus lines in the downtown area. The W train, which directly served the Battery Park City community will stop it’s regular service on Friday, June 25th. It’s all a wee bit ironic, considering the state could be considered biting the hand that fed them some much needed financial infusion for their large budget gap. The most contested transit change, the elination of the M22 was saved at the 11th hour. Saving an important route that served both the BPC and LES communities. 1/9 – The 1 line will continue to have interrupted service on the weekends to accommodate the construction of the South Ferry/Fulton Street transit hubs. R-Â The R will replace the stops serviced by the defunct W line. 4/5/6– Unaffected. Service as usual to Fulton St., Wall St., Whitehall and Bowling Green stops. A/C/E-Â The A/E will continue to have interrupted service on Sundays to accommodate the construction of the South Ferry/Fulton Street transit hubs. 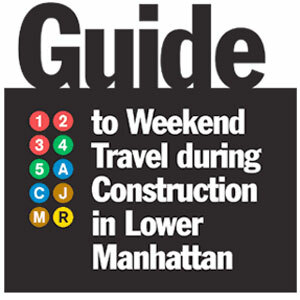 J/M/Z– Reduced train frequencies on the weekends to accommodate the construction of the South Ferry/Fulton Street transit hubs. M22- Weekend and Overnight service will be shortened. M20- Service will be restructured and is TBD. Weekday and Weekend service will be shortened.